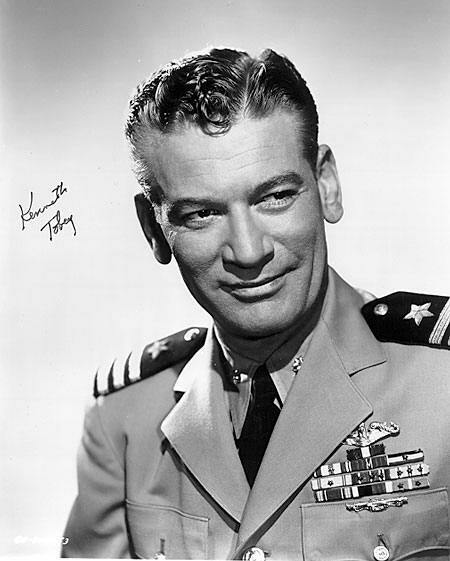 Kenneth Tobey, a character actor who has appeared in over 80 films and numerous television projects over his 50 year career, passed away on Sunday December 22, 2002. He was 83. Tobey first came to acting while studying law at the University of California when he became involved with the school’s Little Theatre. Leaving law school behind he went to study for a year and a half at New York’s Neighborhood Playhouse where his classmates included Gregory Peck, Tony Randall and Eli Wallach. Through the 1940s Tobey acted on Broadway and in stock companies around the country. His first film was the 1943 short “The Man on the Ferry” and his feature film was the 1947 Hopalong Cassidy Western Dangerous Venture. 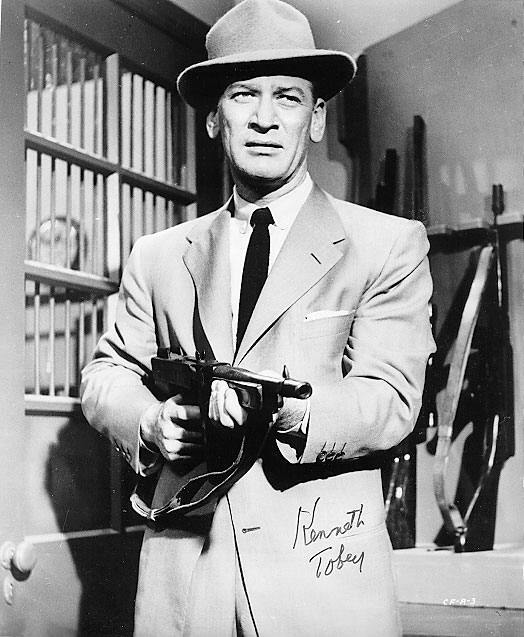 Although he would primarily work in gritty, noir-ish crime dramas like Kiss Tomorrow Goodbye (1950), Angel Face (1952) and Down Three Dark Streets (1954), Tobey also appeared in war films like The Flying Missile (1950), Fighter Attack (1953) The Wings of Eagles (1957), westerns like Rage At Dawn (1955) and comedies like My Friend Irma Goes West (1950). He is perhaps best remembered for his role of the tough Captain Patrick Hendry in 1951’s The Thing From Another World. He also appeared in the genre classics The Beast From 20,000 Fathoms (1953) and It Came From Beneath The Sea (1955). He would also lampoon the low budget, science-fiction monster films he had worked on by appearing in the 1981 spoof The Creature Wasn’t Nice (aka Spaceship). Tobey’s work wasn’t confined to b-movie programmers. He also appeared in more presitgous films as The Man In The Grey Flannel Suit (1956), Gunfight at the OK Corrall (1957), The Candidate (1972), Walking Tall (1973) and MacArthur (1977). He also worked in television, appearing over the years in series such as Disney’s Davy Crockett, I Spy and Perry Mason, Adam-12, The Streets of San Fransico, Night Court and Star Trek:Deep Space Nine. From 1957 to 1959, Tobey co-starred with Craig Hill in The Whirlybirds, a half-hour adventure series in which they played partners in a Southern California helicopter-for-hire business. Remembered by directors in `80s for his films of the `50s, John Landis would cast Tobey in The Howling (1981), and Joe Dante use him in Gremlins (1984), Innerspace (1987) and Gremlins 2 (1990).